The missing MLA of Belgaum South Abhay Patil who was not seen in the Ganesh celebrations and also not seen on Hoardings wishing Belgaumites made a handsome entry on the haordings with huge size banners of Abhay Patil presents Voice of Belgaum and Little champ conest banner. 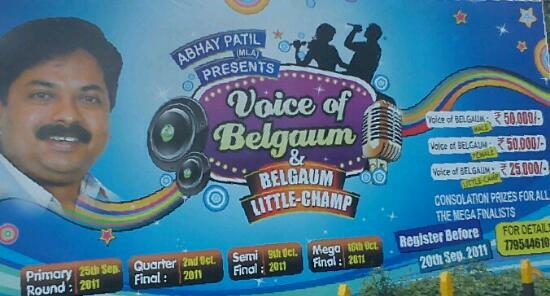 The winner will be given a cash prize of Rs.50000 for male and female and Rs.25000 for Belgaum Little Champ. Registration closes on 20 september. hey iam shubham the vob’s winner yaar. Kaun se TV pe telecast hoga..?? haahahaha..
Really sad to know tat our MLA have so much time for organising these kinds of events. LoL When I read 'Voice of Belgaum', I initially thought that 'Great, finally some politician is thinking of hearing to our voices and possibly do something to address the issues faced by us in day to day life' (read as Good Road, Water and other basic needs of life). And here…..what can I say. Although I am a big supporter of encouragement of talent, I would think that there are more impending issues that need attention. I think they should organise "Voice of Belgaum" to voice the woes of the Belgaum people! why dont they put hoarding stating their annual income? may be the money they got through bribe and other corrupt illegal means is put to organize such events. MLA's should first think of developing BGM instead of wasting time in organizing these events. There are local TV channels and other event organizer who can organize such event.